One of the challenges in eating a mostly local diet is that you are at the whim of mother nature. The rain or lack thereof, the temperature, and of course the time of year. I overheard at the farmer’s market today that they didn’t have any Cornish hens because the rain had changed the growth of the chickens and they weren’t ready to slaughter yet. This year we didn’t get any snap peas from the CSA because they didn’t survive the very wet spring. In fact our CSA (by their own reckoning) had the worst start ever, with the yield being less than half of average. But over the last week, we’ve been flung headfirst into the bounty of the local produce. We always hit a point in the summer when we are overwhelmed with volumes of food and what to do with it. Last year it was peppers. This year it is with squash and zucchini. So last night we had a summer veggie meal. Baked cheesy summer squash and broccoli, hakurei turnips in lavender cream, and corn on the cob. The squash and turnips were from our CSA, the broccoli and lavender was from our backyard, and the corn was from the farmers market. Several folks on Facebook asked for the recipes so they are below. Last year I bought gobs of blueberries with the intent to freeze or dry them so I could have yummy blueberries in the winter. I unfortunately, didn’t get to them before they began to ferment on the porch (no room in the fridge). This year, I am not letting that happen again. I am in the process of preparing about 2 lbs. of them to dehydrate. Don’t be fooled by the “nature’s best” packaging or placement in camping stores, dried fruit has a lot of sugar. Added sugar. Lots of it. The way to get around this is to make fruit leather, but most grownups don’t want to eat fruit roll-ups. Though fruit leather is fabulous in its own right. But I wanted to make dried berries to snack on, or add to recipes. 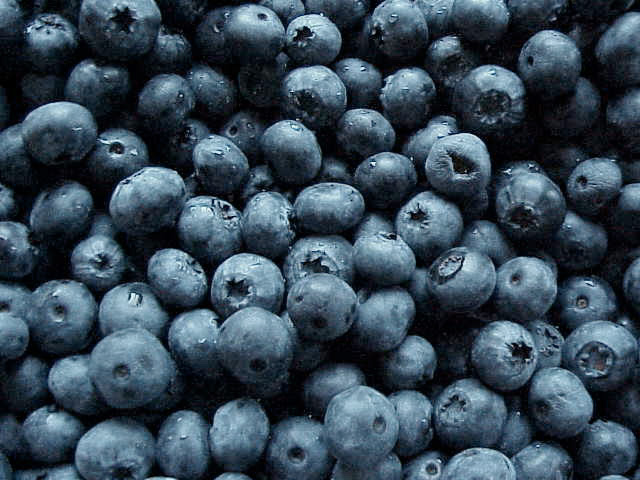 I have 3 books on drying foods, and they all agree that blueberries are best when glaceed. I’ve done this once before, making candied dried orange peel. This is a 4 day process. On the 1st day, you make a sugar syrup and then cook the berries (to 180 degrees), turn off the heat, let cool, cover and let them sit for 24 hours. The next day, you strain the berries out of the syrup, add more sugar to the syrup, add the fruit back in, heat it back up to 180 degrees, turn off the heat, let cool, cover and let sit for another 24 hours. This is repeated for 2 more days (more sugar, heat, steep for a day, repeat), and at the end of the process, you finally dry the berries in the dehydrator. And you have some yummy blueberry syrup to boot. I made this up, so this is to the best of my recollection, and in the true spirit of eating what is available, use what you have, not necessarily what I used. Add some tomatoes, mushrooms, green beans, whatever you have on hand. 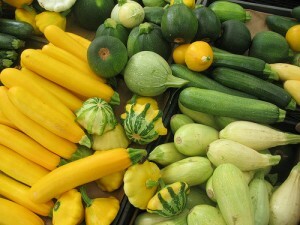 The key to good summer squash and zucchini is removing the excess liquid, so you don’t end up with watery, soft, mushy veggies. The same goes for tomatoes. If you add tomatoes, start by slicing thinly and then spread on paper towels and sprinkle liberally with salt. Blot dry. Add them in a layer after the sauteed veggies, before the cheese. 1. Preheat oven to 350, and grease a baking pan. 2. Chop the veggies. Start with the squash and zucchini, thinly slice, and place in a colander. Toss with a liberal amount of salt. You should be able to feel the grainy salt on the zucchini. Let sit while you chop the rest of the veggies. The salt sweats some of the moisture out, making for less soggy squash. 3. In a large skillet on medium high heat, saute onion and garlic and fresh pepper in a liberal amount of olive oil until brown and caramelized. 4. Add the broccoli and saute until broccoli turns bright green. 5. Squeeze any excess moisture from the squash, then add to the skillet. Saute until the squash is cooked and begins to brown. This is when you know you’ve evaporated the excess liquid. 6. Transfer the sauteed veggies into the baking pan. The veggies shouldn’t be layered too thick, they should just cover the bottom of the pan. Add the shredded cheese, top with parmesan. 7. To julienne basil, stack the leaves together and roll tightly into a cigar shape. Slice thinly across the rolled bundle. Sprinkle the basil atop the veggies and cheese. 8. Bake in the oven until the cheese is melted and bubbly (throw the broiler on for a couple minutes to brown the top of the cheese if you wish). 9. Serve immediately. Bon apetite! Hakurei turnips are not like normal turnips. 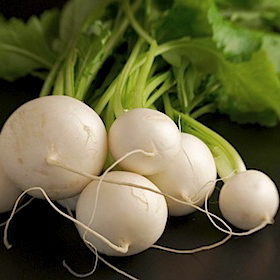 They are sometimes called salad turnips or japanese turnips. They are smaller, and all white, and very sweet. These are great just to peel, slice and eat fresh or put in crudites. Or in cream. What isn’t to like about anything cooked in heavy cream. For the lavender, you want the leaves, not necessarily the flowers (though it probably doesn’t much matter). 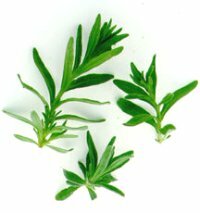 A couple sprigs, strip the leaves and chop (or not, they’re tiny leaves to start with). 1. In a small saucepan over low heat, combine cream and lavender and salt and pepper to taste. As soon as it begins to bubble, cover and turn off the heat, letting the lavender steep. 2. Meanwhile, trim the tops off the turnips (save these, turnip greens are yummy too!!). Peel turnips and cut into wedges. Place wedges in the cream and turn the heat back on low. 3. With the lid on, let turnips simmer about 10 minutes or until they are just tender and the cream begins to thicken slightly. 4. Adjust seasonings and serve. This recipe is from a blog by someone named April Fulton, though I can’t find her blog on the web anymore. So we will carry on the recipe, April. It’s awesome. I just picked a bunch of these out of my garden a half hour ago, and now I know how I’m going to prepare them! the greens will be mixed in a sauté with kale and chard.